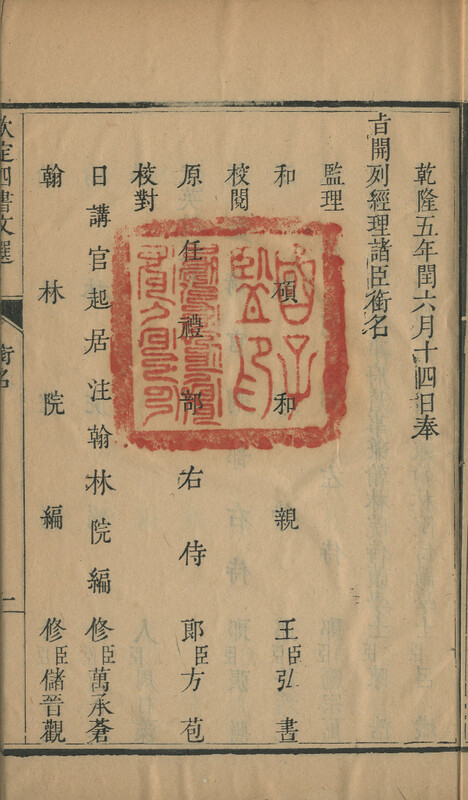 In the Backhouse Collection there is an edition of the Wujing sishu 五經四書, the most important sections of the Confucian canon and essential reading for anyone about to take the official examinations. This edition has puzzled me for over thirty years. During that time – I can’t remember when, where, or how – I came across a catalogue entry for an edition in the Bavarian State Library which I thought might be the same as ours. Actually, we have two copies of this edition, but both are incomplete. I was once tempted to shelfmark them together, but this would have been quite wrong as although the paper of both text and covers is the same, as is the thread and the silk used for the corner protectors, the fascicles differ in size by a few millimetres. 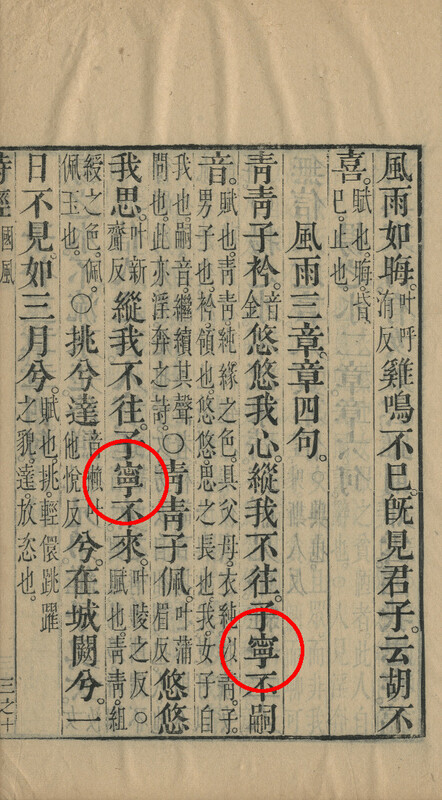 Also, the seals and tao 套 show that they are ultimately of different provenance (we can ignore the manuscript label 「殿本四書」; if labels were an indication of contents, we would have Song editions – we have none). 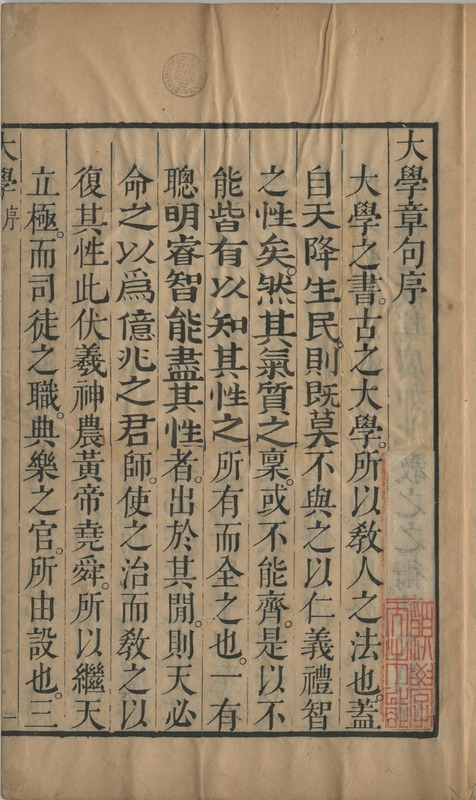 In his list of Palace editions (清代殿板書目), the authoritative Republican period bibliographer Tao Xiang 陶湘 inverts the sequence of the two sections of this work in the overall title, calling it Sishu wujing duben 四書五經讀本; and unusually (because for the most part it’s simply a list) he goes into some detail about the edition. 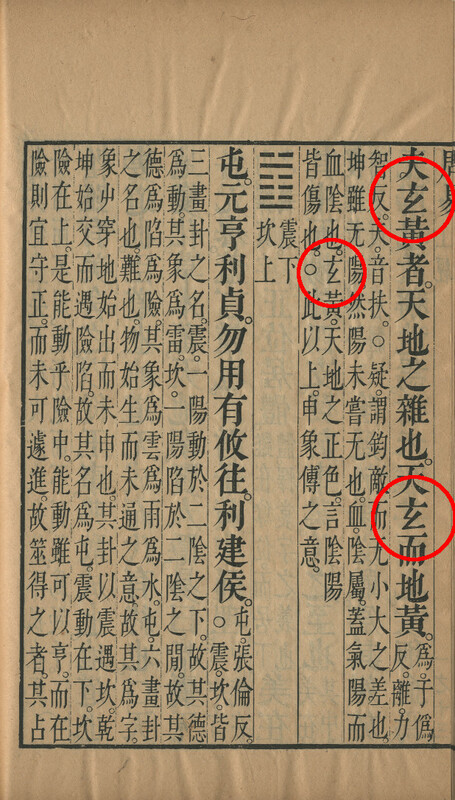 It was supplied to the Guozijian 國子監 (the “Imperial Academy”) and the Baqi Guanxue 八旗官學. 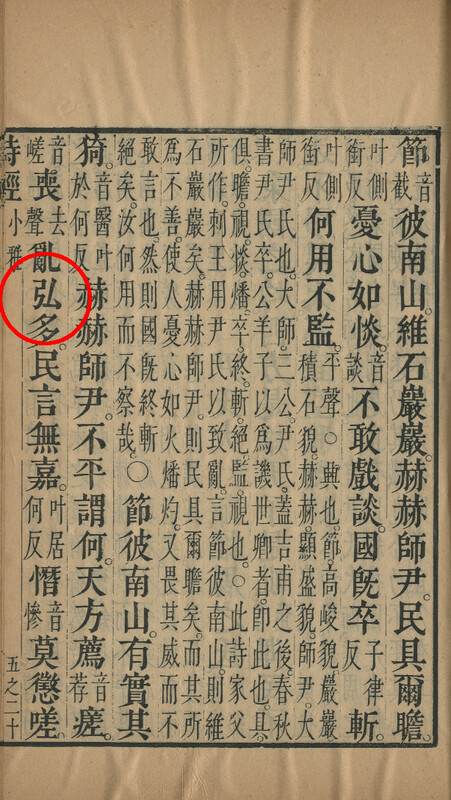 The latter was a department of the Guozijian set up in the first year of the dynasty (1644) to educate the offspring of the Eight Banners who were not members of the imperial family. 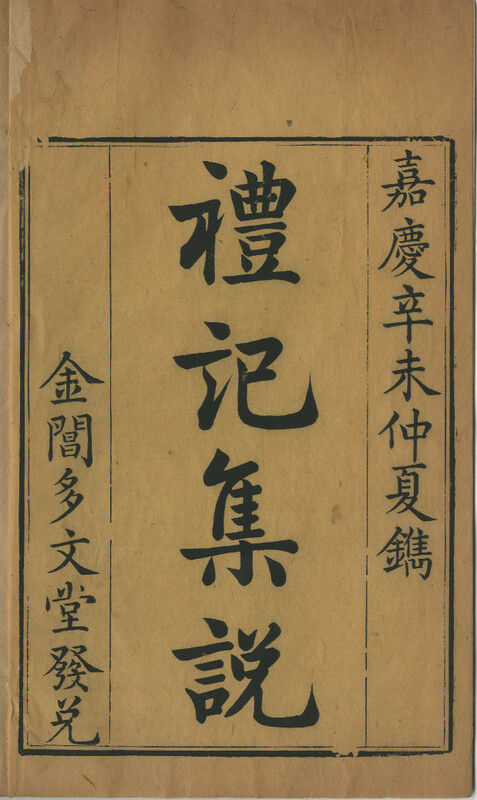 It was also supplied to provincial academies and commercial publishers, who used it as a model for their own editions, which were therefore popularly known as “Academy editions” 監本. 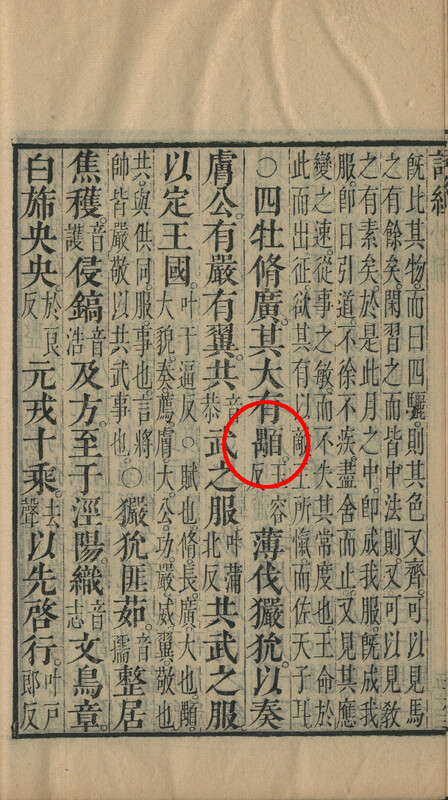 When first published, the Chunqiu 春秋 was the version with Hu Anguo’s commentary, as shown above, but during the Qianlong period this was replaced with the Zuozhuan 左傳, and Hu Anguo’s commentary fell into disuse. 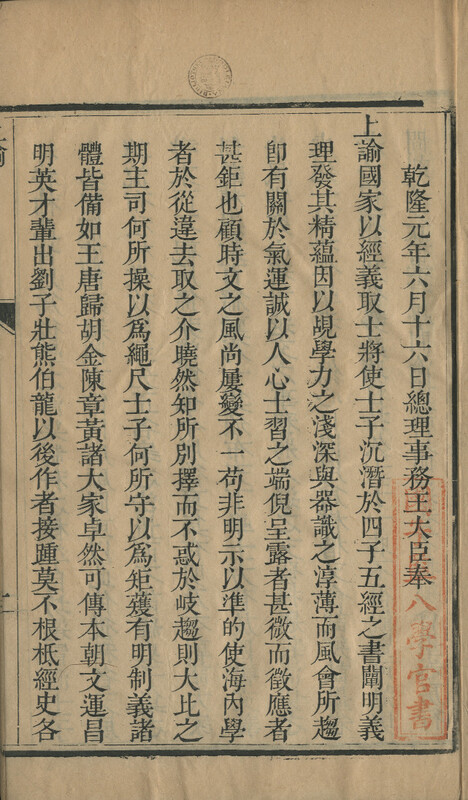 The entry in the descriptive catalogue of government editions prepared by the National Palace Museum Library and Liaoning Provincial Library (清代內附刻書目錄解題, 紫禁城出版社 1995, 18-19) is based on the copies in those libraries, and corresponds with the Munich and Oxford copies in all but one respect: it describes the text frame as having a double border (雙邊), whereas ours is single (單邊), and so does the entry in Weng Lianxi’s 翁連溪 illustrated catalogue of government editions (清代內附刻書圖錄, 北京出版社 2004, 3). The descriptions in the two catalogues are identical, and one must have been copied from the other, or both from the same source. 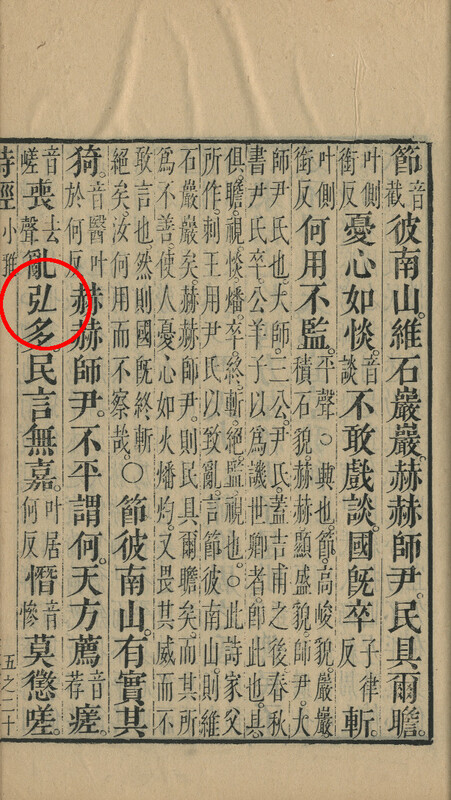 In WorldCat however, the Liaoning copy is described as having a single border 單邊, like the Munich and Oxford copies. 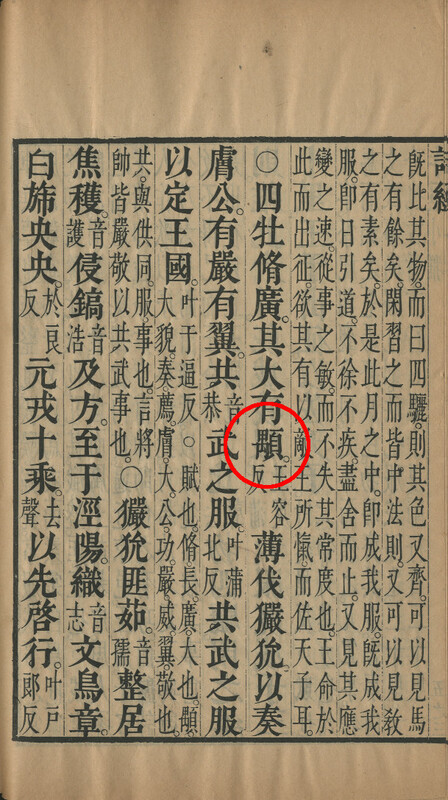 Furthermore, both the CALIS database and WordCat record a copy of the Shijing 詩經 from this edition in the library of the University of British Columbia in Canada which is also described as having a single border. So it seems clear to me that the Chinese printed catalogues are mistaken. 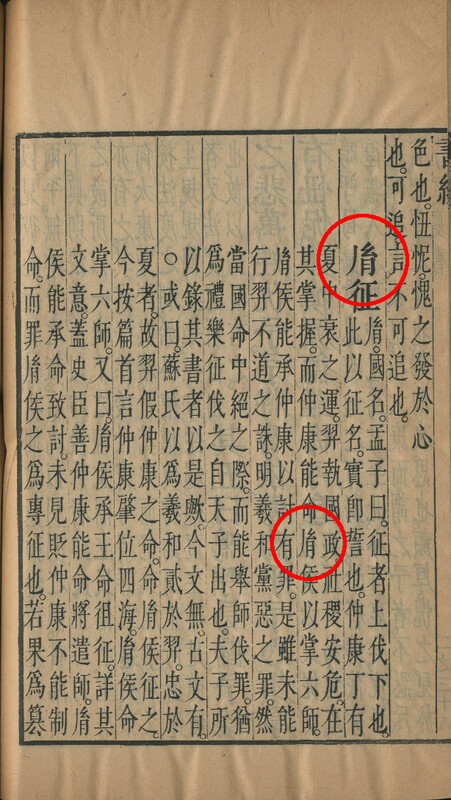 So how do we know that the copies in Munich and Oxford are of the same edition as those in China? In the edition itself there is nothing to help us. The overall title is invented, and there is no prefatory material relating to the edition, only the standard short prefaces to each individual work. 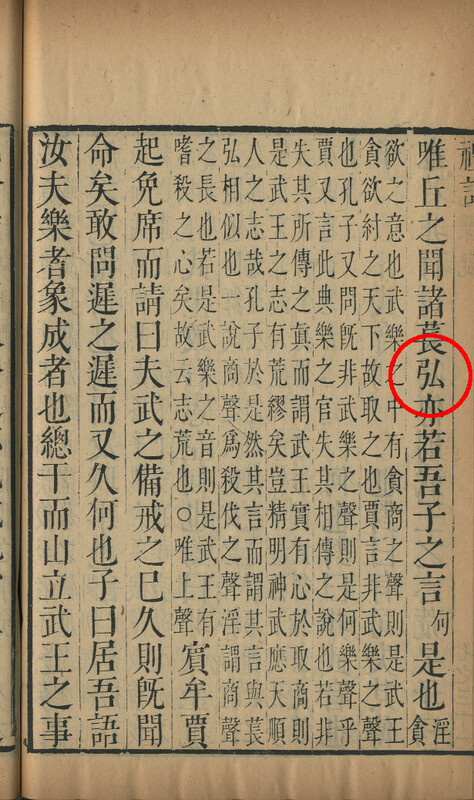 We could make a start with the date, because the edition is a simple, classic example of how works can be dated by examining taboo characters, especially during the reigns of the Kangxi 康熙, Yongzheng 雍正, and Qianlong 乾隆 emperors, when the observance of taboos was particularly strict. This does not necessarily mean that the edition was not made in his reign, as only in the thirteenth year (1748) was the order given to avoid the taboo of his personal name by omitting the last stroke. But it is generally reckoned that the edition was made during the Yongzheng period, and the taboos do not preclude that. 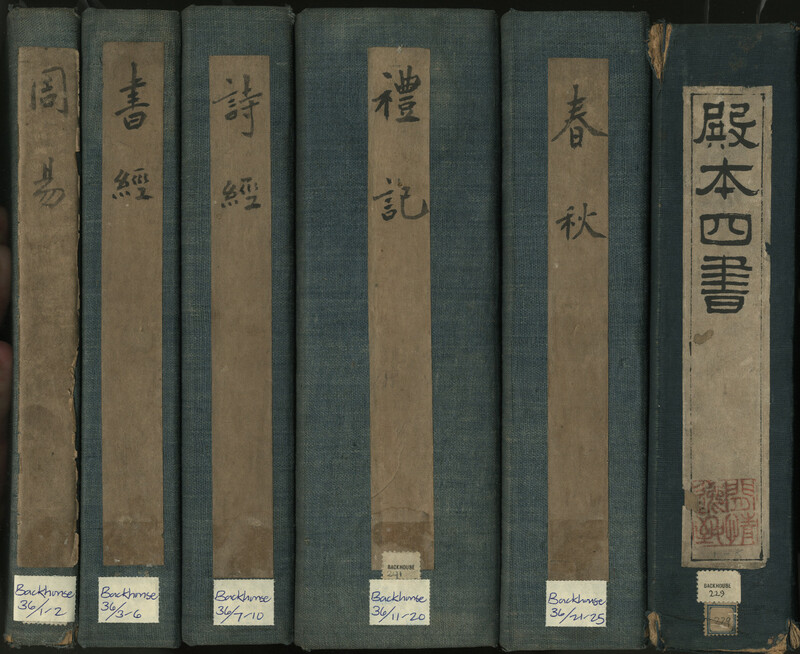 We have copies of individual works made from this edition later during the Qing dynasty, and it is instructive to compare them with the orginal edition, and to note how the taboos have been treated. A large square seal has been excised in the upper half of the leaf and the text replaced in manuscript; and in the bottom right corner, a large vertical seal has been excised and replaced by a new owner’s seal. 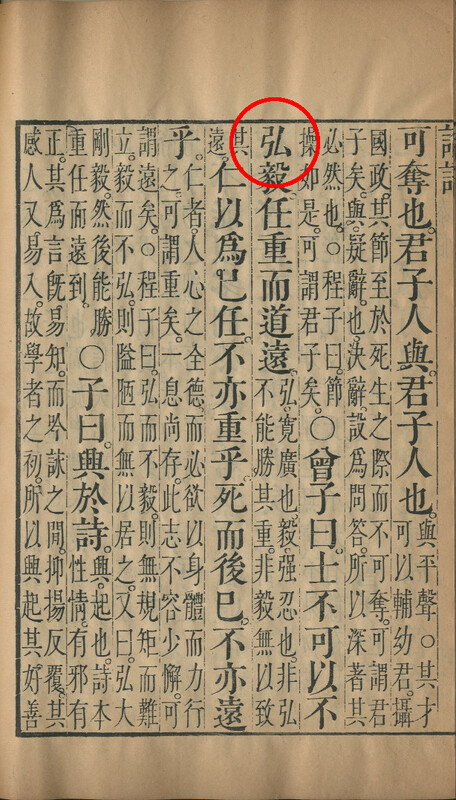 The seals are 「國子監印」 and 「國子監八學官書」, the Imperial Academy and the Baqi Guanxue, precisely the establishments that Tao Xiang says the edition was made for.